Buying a House with a Pool? Here’s what you need to know. For those of us living in the Northeast, Spring is not only a time for growth- and rain- it’s also the time when we look around our homes and grow tired of what we see. We’ve been cooped up for so long that we need to change the scenery a bit. The house gets cluttered, closets are a bit disorganized, and the sunlight gives us a boost of energy to get something done. 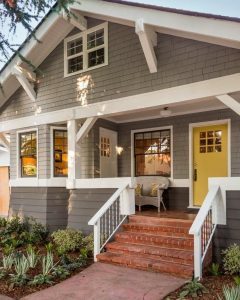 Here are a few projects you can do over a weekend or two to get your house into clean, working order again. These are great projects, as well, for those who are planning or considering listing their home for sale in the near future. If you like the looks of your home, others will too. -Front Door: Paint it a fun and welcoming color. If it’s stained, sand it and re-stain it a more current color. Update the hardware and clean the windows to make it shine. Grab a new welcome mat and a potted plant and you’re good as new. -Replace the address numbers. There are many new contemporary typefaces available, but as well, you can order decals on websites like Etsy to really personalize the look. -Get a new mailbox: If the one you have has seen one too many rain storms and the color is now rust, you might consider picking one up from your local hardware store. You can get one for under $50. -Update the lighting: Replacing the post light and the front sconces will make your home seem brighter and newer! Add some string lights to the front porch and your home will look like a Pinterest post. Focus on one common area room first, like the dining room, for example. -Walls: Add wainscoting or a chair rail and repaint the walls. 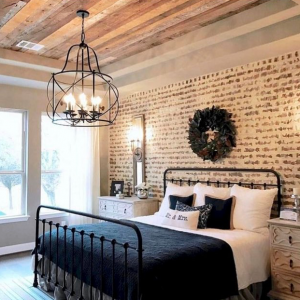 You could also add an accent wall with a complementary color or with wallpaper. -Ceiling: Remove a popcorn ceiling or add crown molding. If it’s been a while, paint the ceiling first. A bright white ceiling makes a room look larger and cleaner. -Windows: It’s amazing what Windex will do. After the windows are cleaned, replace the window treatments for a fresh look. If you decide to replace the curtain rods, hang them halfway between the top of the window molding and the ceiling. It’ll make the windows seem bigger and ceiling seem higher. 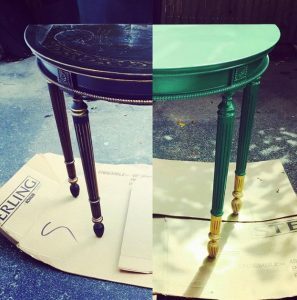 -Refinish a tired piece of furniture. For a greater effect, pick a piece that is the focal point of the room and choose a bright color to make it fun. The kitchen is where we spend most of our time. A clean, well-decorated one is easier on the eyes and makes everyone feel comfier. -Hardware: Update the cabinet hardware- be sure you know how wide the existing hardware is. It’s recommended you bring one to the store to make sure the holes line up with the new pulls you pick. -Update that old faucet to make the sink more functional and feel new. 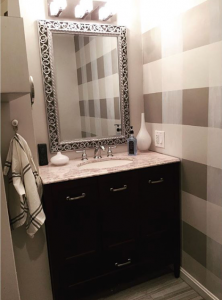 It doesn’t have to be the same finish as the cabinet hardware anymore. People are mixing it up! Make sure the new one complies with the holes already drilled in your sink or countertop. -Backsplash: If you’re really handy, replace the tile backsplash with new tiles. The most classic look is a white subway tile with white or charcoal grout. For those who want a quick facelift without all the power tools, your local hardware store will also likely carry adhesive tiles that stick directly onto the wall! If your basement and linen closet resemble the aftermath of an earthquake, this project should go to the top of the list. As overwhelming as it can be to stand in a disorganized room, once you start it becomes therapeutic and cathartic to get rid of the old, dead weight. Begin by throwing out all trash. Any items that are to well-used to donate; items that are broken or torn, toys with missing pieces, or used toys that are too worn to pass on. Right then and there it’ll feel less daunting. Then go thru and put together a pile to donate. These are items that are gently or barely used that you haven’t used in over a year or that you’ve grown tired of. Teachers love toy and craft donations, but beyond that, there is always a local shelter or donation receptacle where you can drop these items off. Once everything unnecessary is out, it’s time to organize what’s left. What’s left should only be what you use and what you need. Start with one corner or wall or bookcase, take everything out, and put back in a more orderly fashion. Use decorative storage containers with labels and shelf dividers to sort everything. In the end, everything should have a home. If there’s no room for it, it doesn’t belong. Design tip: Paint the insides of your built-in shelves or bookcase a contrasting color. It takes no time and gives an unexpected pop of interest! This is more than a weekend project because it’s something that needs care almost every day. But it does take a weekend to get it ready for the season. Seeding the grass, spreading new mulch, pruning overgrown bushes and trees are just the start. Planting annuals for seasonal color and perennials and long-lasting growth keeps the garden looking fresh and well groomed. After all, landscaping does add value to a home! -Paint the insides of your built-in shelves or bookcase a contrasting color. It takes no time and gives an unexpected pop of interest! -Turn an entryway into a mudroom: A foyer with shoes and backpacks all over the floor is hardly a welcoming space to walk into. Add hooks to the walls for backpacks and get a storage bench to tuck shoes away and you have yourself a functional entryway! -Whitewash a brick fireplace: With a solution of half white paint and half water, dab on the whitewash to a clean, dust-free brick surface. Do this in sections and after each section, using a damp cloth dab away some of the whitewash to give the coat of paint some texture. You can make it as white or as see-through as you like depending on the color of the brick. You don’t have to be an interior designer to make your home feel fresh and cared for, but it can be overwhelming when it seems like there is a lot to do. Break it up by project and try to tackle one thing at a time! Whether you’re sprucing up your house, or prepping your home for sale, these projects can be done by anyone on a weekend!